Piazza Santa Trinita is one of my favorite places in Florence. 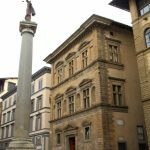 I already wrote an article on the church of Santa Trinita, that I consider to be the best free attraction in Florence Italy and today I want to write about Palazzo Bartolini Salimbeni, a palace standing in the same square, right in front of the church. When giving a guided tour, I always observe my customer reactions. I never prepare them for what’s behind the corner, because their surprise or indifference tells me a lot on what they expect from me and helps me make a better job. 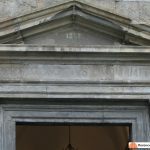 Now, Palazzo Bartolini Salimbeni is not the Duomo… not an attraction that lets people turn their heads: it’s just another palace of the Renaissance, not very large, with no heavy decoration. 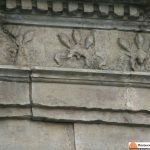 Many people don’t even notice this piece of architecture, but often my customers, after briefly looking at it, give it a second look, like if they noticed something. It’s a great professional satisfaction for me when I see this happen; it means that, maybe even unconsciously, they are attracted by something different. That’s when I decide to stop and dedicate five minutes of my tour to Palazzo Bartolini Salimbeni, explaining what attracted tourists to look at the architecture twice. They won a prize and are getting to know a very nice story. 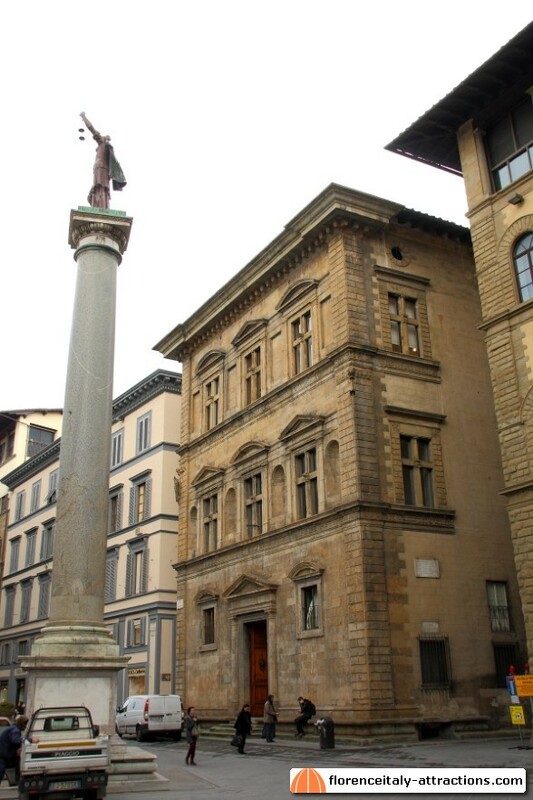 The palace was designed by Baccio d’Agnolo and built between 1520 and 1523, late Renaissance for Florence. Baccio d’Agnolo had been in Rome for years, being influenced by the Roman style. 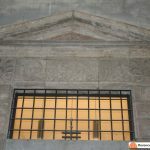 The “crossed” windows, and also the heavily projecting cornices are mutuated from this different style, and that’s probably what our brain feels unfitting in the Florentine architectural environment. The funny legends start now. 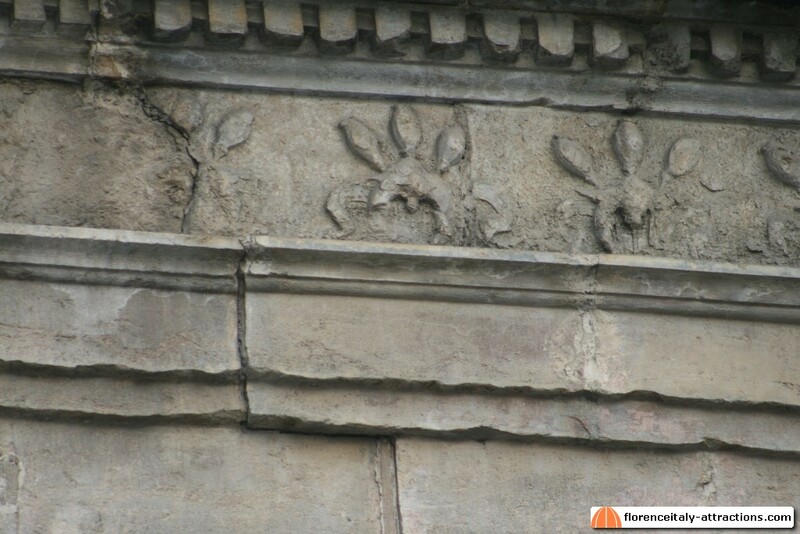 Hard to see because of the color of the stone, the frieze between the floors shows a returning symbol. Looking better, the symbol represents poppies, used to induce sleep in the past; on one side there is an inscription, per non dormire, literally “in order not to sleep”. This was the family motto and comes from a Medieval legend: Florentine merchants went to Northern Europe facing long and dangerous trips to reach the place where they could buy the best stocks of high quality wool. Such trips were very risky, you could never come back, you could come back bankrupt, or you could come back extremely rich. Looks like the night before the auction, having dinner with other merchants, the Bartolini Salimbeni added poppies to the soup of their competitors. The day after, with all the other merchants sleeping, they were the only ones to compete in the auction, buying a huge stock of wool which was the origin of their wealth. 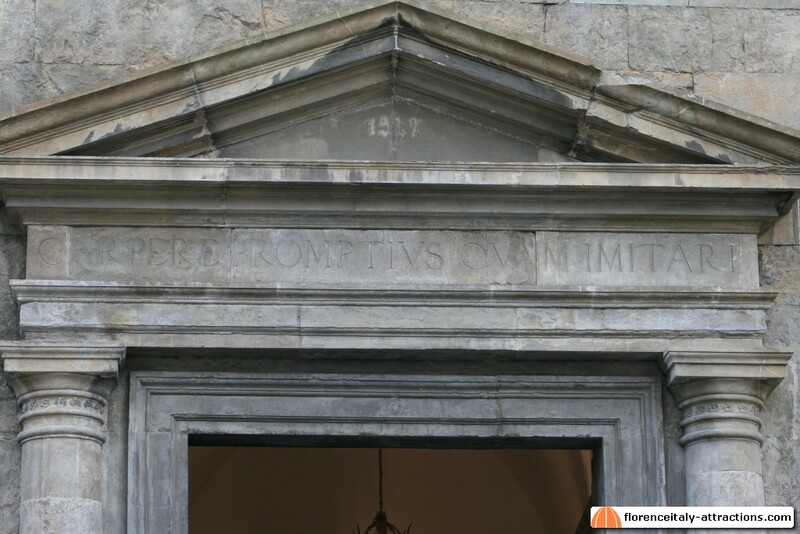 It’s not over: right above the main doors of Palazzo Bartolini Salimbeni, another inscription, this one in Latin, says: carpere promptius quam imitari. Literally this means “criticizing is easier than imitating”. 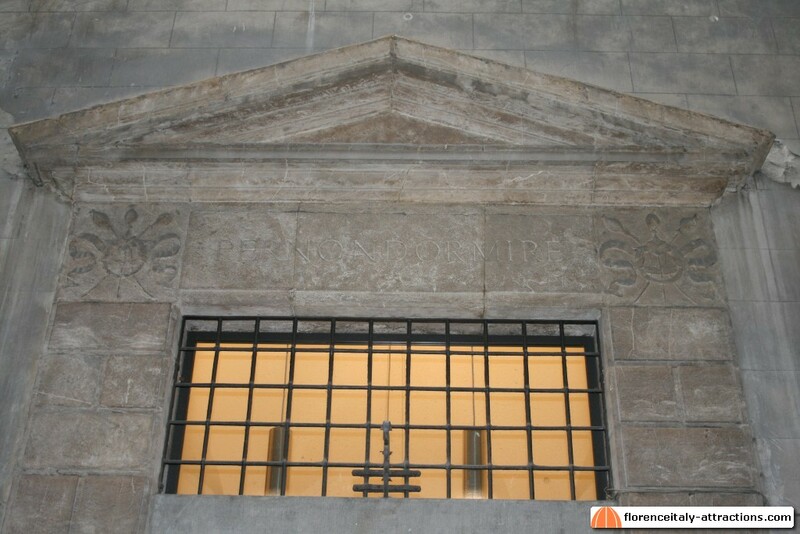 The inscription was added by the architect, Baccio d’Agnolo, after his work was heavily criticized: jealous of their traditions and style, Florentine architects didn’t appreciate a “Roman” building in their city. Actually, this design started a transition from Renaissance to Mannerism, and was imitated many times in the following decades.